I’m not a huge fan of typical beef stew. Cubes of beef with veggies in a broth is just not that exciting to me. Pot roast is a bit better … succulent beef that falls apart or shreds at the lightest touch… better but not perfect. Spicy shredded beef on noodles (and not just any noodles, but toothsome, slippery Udon noodles) – now you’re talking beef perfection!!! Slow-Cooker Chinese Beef Stew with Noodles might just become my new favorite comfort food. This is fancy enough for company but also perfect for cozying up on the couch in your jammies with. To top it all off, it’s made in the slow cooker! Hands-off comfort food. You just can’t beat that! I got this winner from Food Network Magazine. It couldn’t be easier to prepare or tastier to eat. I did change up the recipe one little bit: it called for watercress as it’s “greenery”. Hubby doesn’t care for watercress and I already had a combination of spinach and arugula so I used that. Put the beef in a 6- to 8-quart slow cooker and season lightly with salt and pepper. Whisk the flour and 1/2 cup water in a small bowl until smooth, then whisk in the hoisin sauce, soy sauce, tomato paste, chili-garlic sauce and ginger. Pour into the slow cooker and turn the beef to coat. Add the star anise. Cover and cook on low until the beef is tender, 7 to 8 hours. Discard the star anise and transfer the meat to a plate. Shred into bite-size pieces, removing any large pieces of fat. Skim off any excess fat from the liquid in the slow cooker. Return the meat to the slow cooker and season with salt and pepper. Bring a large pot of water to a boil. Add the noodles and cook as the label directs; drain. Divide the noodles and beef stew among bowls. Top with the spinach/arugula, scallions and a drizzle of balsamic vinegar. Beef Ragu is generally big, bold, rich, and definitely Italian. It is usually a slow-cooked sauce of decadent beef loaded onto a pile of perfect pasta. Nothing wrong with that in the least! As a matter of fact it is one of my all time favorites. Until of course you are cooking dinner for someone who is avoiding gluten. That is when things get a bit challenging for me. Until now. 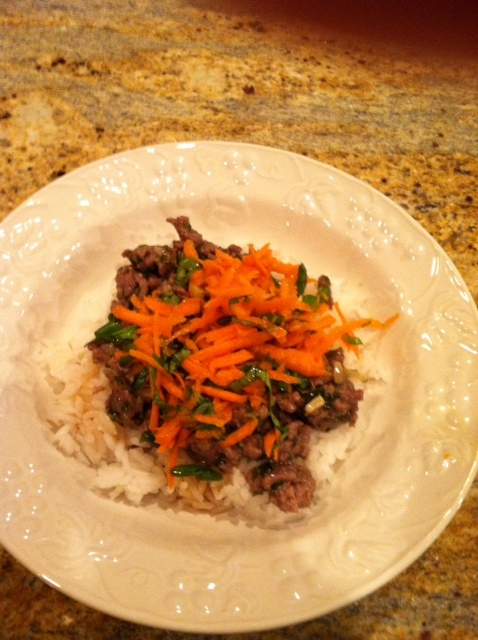 Enter Thai Ragu with Rice Vermicelli. This was a light (no, really!) bright and zesty dinner that definitely had me re-think ragu. And, it was done in a flash which gave me lots of time to visit with my dinner guest. 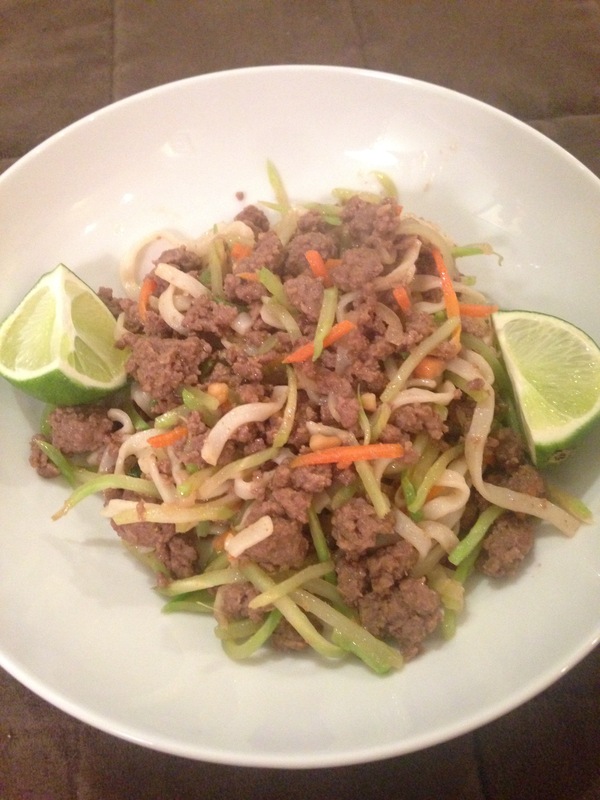 This recipe comes from Cuisine at Home Magazine and will probably replace my Thai Beef and Basil recipe that I’ve made a bunch of times, I think this is just an all-around better recipe. Heat oil in a saute pan over medium. Add shallots, garlic and ginger; cook until shallots are translucent, 3-4 minutes. Stir in curry paste and cook for 1-2 minutes. Add ground sirloin; cook until browned, breaking up clumps with a wooden spoon, about 5 minutes. Whisk together broth, fish sauce, and brown sugar until brown sugar is dissolved; stir into ground sirloin mixture and bring to a simmer. Cook ragu until liquid is reduced by half, about 5 minutes. 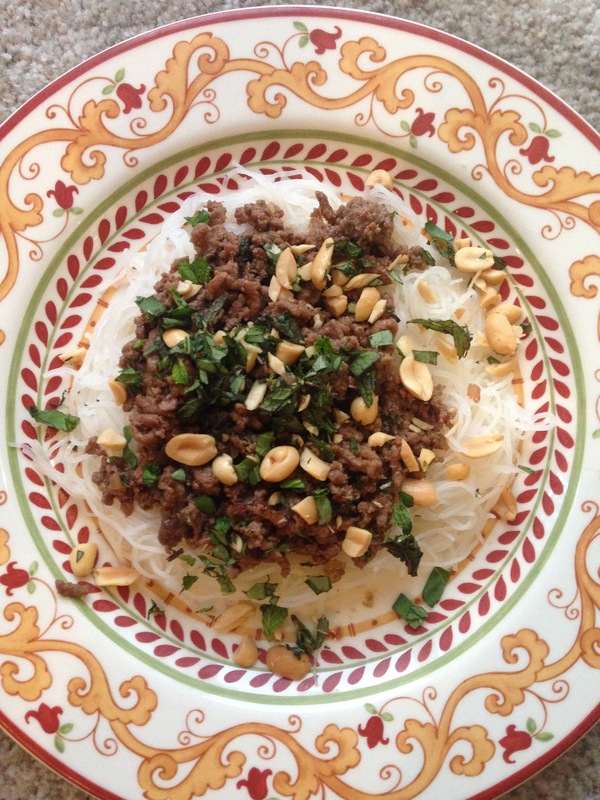 Serve ragu over vermicelli and top servings with basil, mint and peanuts. 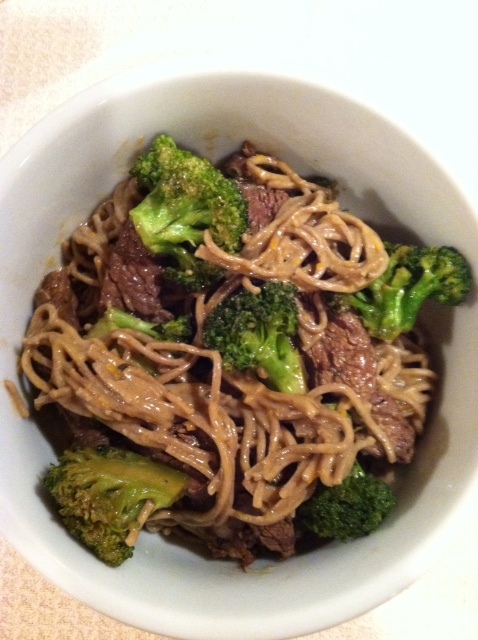 Weekly Winner: Beef + Broccoli + Buckwheat = Booyah! I’ve made this week’s winner before — I’m certain I have. Thing is, I just don’t remember it being so good! Usually you think of stir-fried beef and broccoli as being served over rice. It would have been fine over rice — quite tasty actually. But add one of my favorite things in the world — peanut sauce — and then put that on soba noodles…..Ding, ding, ding … we have a winner! The other surprise about this dish is that I’ve always had peanut soba noodles cold. Having them hot with the beef and the broccoli made it a yummy, comforting dish for a chilly, dreary evening. The recipe comes from Fine Cooking Magazine. It just goes to show you should make recipes you like more than once … obviously you get better at it as you go! Practice may not make perfect … but it makes it pretty dang good! Bring a medium pot of well-salted water to a boil. Toss the beef with 2 tsp. soy sauce and 1/2 tsp. salt. Finely grate the orange zest and then juice the orange. Put the ginger and garlic in a food processor and pulse until minced. Transfer all but 1 tsp. of the mixture to a small ramekin. Add the peanut butter, zest, 2 Tbs. of the juice, and 2 Tbs. of the soy sauce to the food processor. Process until smooth, adding 1 to 2 Tbs. water so the mixture loosens a bit. In a small bowl, mix 2 Tbs. of the remaining orange juice with the oyster sauce, the remaining 1 Tbs. soy sauce, and 2 Tbs. water. Cook the soba noodles in the boiling water, stirring occasionally, until just tender, about 5 minutes. Drain well. Transfer the noodles to a large bowl and toss with the peanut butter mixture and half of the mint. Meanwhile, in a large skillet, heat 1-1/2 Tbs. of the oil with the minced garlic and ginger over medium-high heat until sizzling. Add the beef and cook, stirring, until it just loses its raw color, 1-1/2 to 2 minutes. Transfer to a large plate. Reduce the heat to medium; add the remaining 1-1/2 Tbs. oil to the skillet, and then the broccoli. Cook, stirring, until browned in places, 1 to 2 minutes. Add the oyster sauce mixture, cover, and cook until the broccoli is crisp-tender, about 2 minutes. Return the beef and its juices to the pan and cook, stirring, until heated through, about 1 minute. Portion the noodles among 4 plates and top with the beef and broccoli. Sprinkle with the remaining mint and serve. I’m usually relatively indifferent about beef stews. To me, they all tend to wind up tasting the same. Not bad mind you, just similar. There might be a few different spices or herbs. Some might be beer-based, some wine-based but basically, it is stewed beef with vegetables. Satisfying, but not exceptional. Until now. When I cut this recipe out of Bon Appetit magazine, I had no idea what Kerala-style meant. I’m still not really sure I know, but what I do know is that this recipe is definitely a winner. 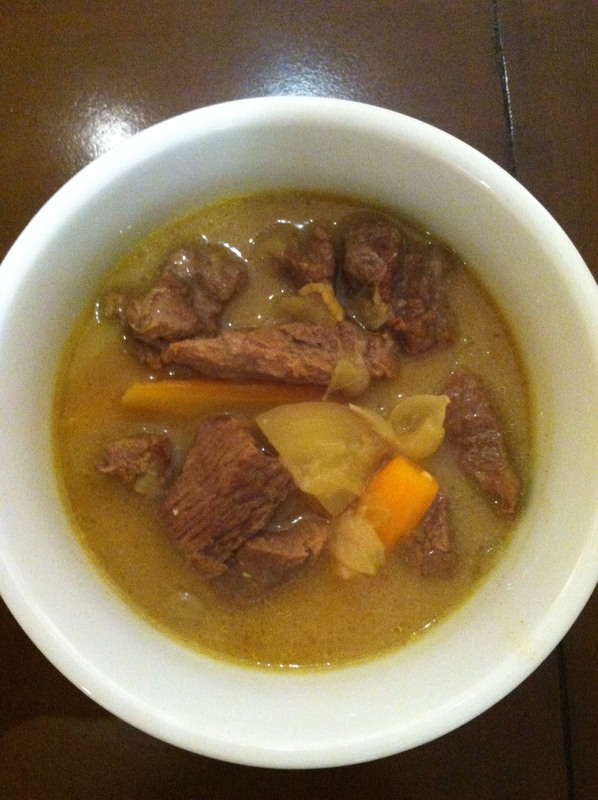 It is a mild-curry flavored beef stew that, thanks to the coconut milk actually winds up tasting a little creamy. It is fragrant, cozy and spectacular. It quite possibly will replace most of my beef stew recipes.